Corporate wordpress theme is a clean and elegant web 2.0 business wp design. The theme’s background is light gray while the main content area is white with rounded corners. Pages links are in the header, above main frame in top right corner. The sidebar is located on the right side and it supports wordpress widgets. 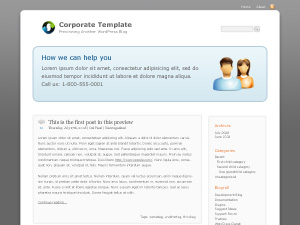 The Corporate wordpress theme. Cross-browser, XHTML Strict v1.0 and CSS 2.1 valid. Great for businesses, corporate blogs and web sites. Comes with customizable intro text, for information read Instructions.txt. Business wordpress template was designed by Ori Pearl. Note: It is best if you disable the callendar widget as there seems to be some kind of problem with it (it sticks out of the sidebar).